I've loved this recipe for "Cream of Wild Rice Soup" for both its taste and simplicity -- not a load of ingredients, and easy enough technique. (If you click through, you'll notice "turkey" in the title. Just omit the turkey, add a little more wild rice and veggies, and use vegetable broth.) (P.S. I don't use instant wild rice -- I just cook one cup of normal wild rice and stir that in at the end.) 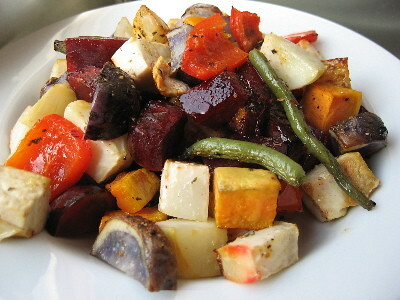 It was nice to get some veggies and whole grains back into my system after all of that sugar! We even had a green salad on the side! Woo veggies! Sunchokes, Jerusalem Artichokes, whatever you want to call them, I finally got around to cooking with the pound of knobbly little sunflower roots I bought at the Farmer's Market LAST weekend. (Not a day ago, but over a week ago!) I was so excited to find sunchokes, since I'd never tried them before, and quickly purchased a pound. Oh yum! I did detect a hint of artichokeish flavor, which I'm sure was enhanced by the slight sourness brought to the party by the plain yogurt I subbed for part of the milk, but really, sunchokes are their own flavor, in my opinion. Light, almost summery, incredibly subtle, fresh, and TASTY! You'd be hard-pressed to find another fall vegetable that tastes more springy! AND, pumpkin cake for dessert! super-awesome treats, among other things! I picked my friend Courtney up from the airport this afternoon, and she brought me a gigantic mountain of treats, just to thank me for picking her up! (I swear Courtney, I'll pick you up from the airport ANY time, treats or not!) She was out east visiting her mom, and I guess there's this amazing bulk foods store by her mom's house. Look what she brought me! Clockwise from far left: golden flax seeds, stick cinnamon, whole nutmeg, organic almonds, dried goji berries, dried STARFRUIT, dried KIWI, and sun-dried tomatoes!!!!! Amazing! I think I'm going to use the kiwi and starfruit as decorations on cupcakes -- they are WAY too pretty to just gobble up! I was also super-excited about the goji berries, since I'd never tried them before! This is salty, noodley, comfort food at its best! Please note if you click through to the recipe . 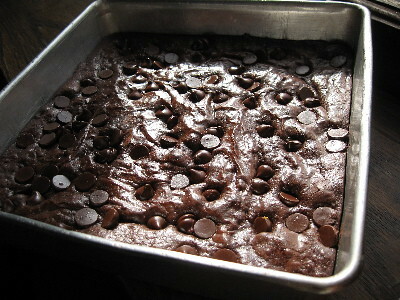 . . the first time I made this, I followed the recipe as written, and it was so salty for me, I couldn't eat it. 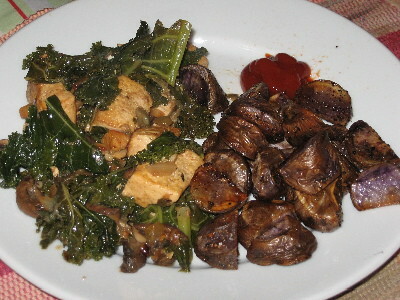 I've cut the low-sodium soy sauce down to 1/3 cup, and that seems to suit my palate better. Also, I always add a block of cubed extra-firm tofu, for added protein and "staying power." I had two bowls of this soup for dinner on Friday night, Dan had three bowls. Yum! Dan woke up this morning and declared sleepily, "I feel like something sweet." Now, Dan never, ever, EVER makes food requests -- I ask him over and over for meal ideas, and he just says, "whatever. Pasta. Beans and rice." I was SHOCKED that he said he was hungry for something! I asked him, "what kind of something sweet did you have in mind?" And he replied, "pancakes!" Wow. I didn't even think he liked pancakes that much! Since pancakes take less than five minutes to make, (not including cooking time,) I was HAPPY to oblige this request. I asked Dan if he would like blackberries in his pancakes, since we had some in the freezer from this summer, and he replied, "that would be INSANE." So, blackberry pancakes it was. Dan had SIX for breakfast, and I ate the last three of the batch later in the afternoon for a snack. Ha! Leftovers, shmeftovers. Hello, cheesy, creamy, pasta goodness. I made Fettuccine with Butternut and Gorgonzola Sauce, from Cooking Light, except I used spiral pasta because I couldn't find whole-wheat fettuccine at the co-op this week. Although this dish used, I swear, every pot and pan I own, it didn't actually take that long to prepare, and was definitely worth the extra scrubbing. Creamy, slightly sweet, slightly tangy sauce, full of squash and onions, smothering whole-wheat spirals made for a VERY comforting dinner. I kept the side simple -- plain steamed brussels sprouts fit the bill. Almost forgot about dessert! How can that be? 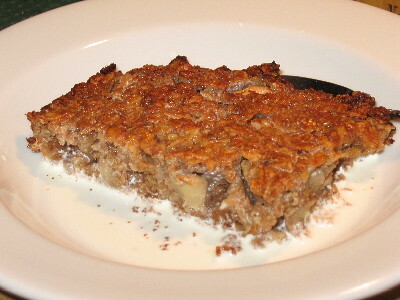 Apple crisp, with a scoop of vanilla ice cream. I love, love, love the apple crisp recipe in Joy of Cooking, which is weird, because I hardly ever cook out of that cookbook! Joy gets used mostly as a tofu weight in my house. :) However, applying that recipe to some of the apples we picked yesterday made a very satisfying dessert. (using some of the goji berries Courtney gave us! ), a pumpkin cake with cream cheese frosting (which we haven't cut into yet, so you'll see it later this week,) washed and chopped a huge bunch of kale, made a batch of almond milk, and roasted up an eggplant and quickly pureed it into some tasty baba ganoush. (Am I spelling that correctly? Probably not. Oh well.) Yay for being prepared for the week! Since the weather was gorgeously crisp and sunny when I woke up yesterday morning, Dan and I decided to squeeze in a double-dose of fall fun after we finished our "to-dos" for the day, (cat to vet, farmer's market, co-op, etc.) We packed a picnic dinner, picked up Dan's brother, and drove east to Afton State Park. Since we had such a dry spring, the fall colors were definitely muted this year, but still beautiful! We enjoyed a 2-hour hike through the woods and prairie, and caught some beautiful views along the way! After stopping back at the state park to eat our picnic supper, Dan drove our tired butts back to the city. Needless to say, Dan and I didn't do much last night, and hit the sack pretty early! Three of our four meals this week included some sort of orange vegetable . . . amazing! And tasty! In other news, Flickr has started to "mess" with me. Grr. I have a mac, and one of the lovely things about Macintosh computers is that often all you have to do with anything is "drag and drop." I used to be able to drag and drop my photos into my blog posts . . . no longer. Now, Flickr thinks I want to add a title or some dumb thing when I click on images! Drat. No more drag and drop for me, and I can't figure out how to copy and paste the dang images, either. So, I upload directly through blogger now, which is more complicated than I originally thought. AAAAAA! Wish me luck! Here's what we've been eating since I posted last . . .
A repeat, but so good, it's worth it! Another repeat! Dan has said, without any prompting on my part, that I make the best pizza he's ever had. Alright! This load from the FM cost us LESS than $20! Can you believe ALL of the squash, except for the pie pumpkin, cost us a total of $3????? Unbelieveable. 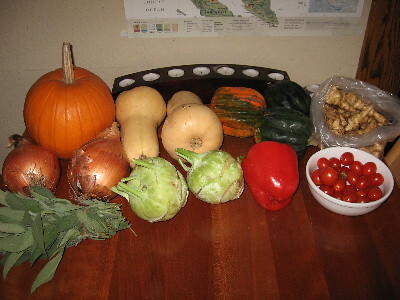 We also scored onions, a red bell pepper, kohlrabi, sage, cherry tomatoes, and Jerusalem artichokes! Now I'll have to start searching for that cream of Jerusalem artichoke soup recipe I saw somewhere . . . !!! I got a late start on my Sunday cooking projects this afternoon because we ran errands today instead of yesterday, and I also had to make lunch! I still managed to get everything done, though . . .
Haven't cut into this yet, since we'll have it with dinner in a bit, but it looks and smells AMAZING! Eating Well has yet to disappoint me, so I expect it will be delicious! I can't wait to devour one of these! 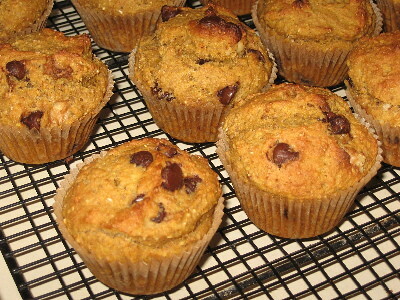 This is a fantastic pumpkin muffin recipe, and with the addition of walnuts AND chocolate chips, I expect heaven! In addition to the baking, I also roasted and pureed the pumpkin, (and I let the puree sit in a strainer over a bowl for a couple of hours to mimic "canned" pumpkin texture, which worked beautifully,) roasted the two butternut squash for the soup I made for dinner tonight, finished the soup, made a batch of soymilk, baked the sweet potatoes, toasted and chopped some hazelnuts for the soup, and washed & spun the lettuce we bought today. WHEW! I'm ready for some soup, salad, bread, and a quiet night on the couch, I think! I swear to you, I feel like I'm doing almost everything I possibly can to reduce my use of resoruces. I took a quiz today, in honor of Blog Action Day, and was surprised by my results -- if everyone alive on planet Earth lived as I, we'd need 1.43 Earths to accomodate everyone! What? We don't have enough Earths! What to do? Buy carbon offsets? Maybe this is our best choice for now. And we'll keep that hybrid in mind for the future . . . . I encourage you to take the test and check out your score -- you may be as surprised as I! Don't be fooled by those below-average scores you may get, either -- clearly, "average" ain't doing us a whole lot of good these days! We should all aim for scoring at or below the "one Earth" level, since, well, that's all we have. Happy Blog Action Day! It's not too late to join in if you're interested! Meals and treats from this week so far . . . This is one of those meals that I make when I can't think of what else to make, or when I have veggie odds and ends to use up, or when I have a ton of gorgeous looking veggies on hand! This week, it was the third reason. 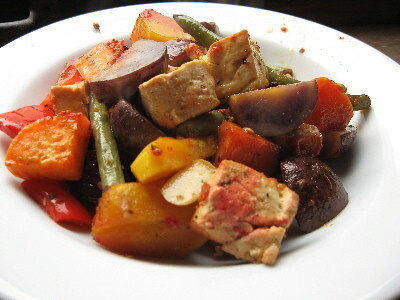 Roasted tofu with red pepper, sweet potato, butternut squash, green beans, purple potatoes, beets, garlic, and "Northern Blend" from Wayzata Bay Spice Company. Holy hell, this was a tasty, nutritious lunch! 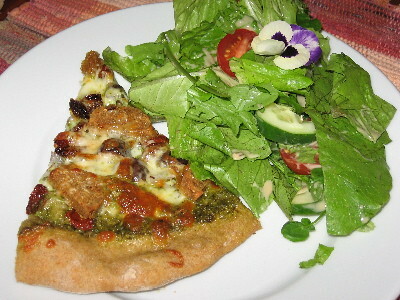 Homemade pizza and salad! 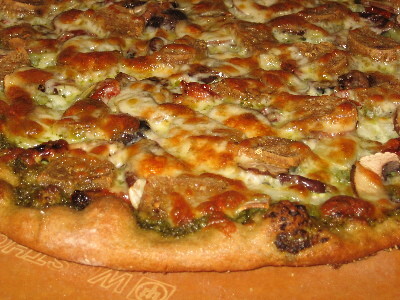 Artisan Bread half whole-wheat crust topped with homemade pesto, local mozzarella and parmesan cheeses, homemade veg Italian sausage, onions, kalamata olives, and oven-dried tomatoes. Thankfully, there's enough extra cheese, another crust, and plenty of pesto leftover . . . I think we're having pizza again later this week! Nom, nom, nom. Not to keep tooting my own horn or anything, (wait . . . that's what you DO on a blog, right? ), but I think I might make the best fajitas I've ever had. 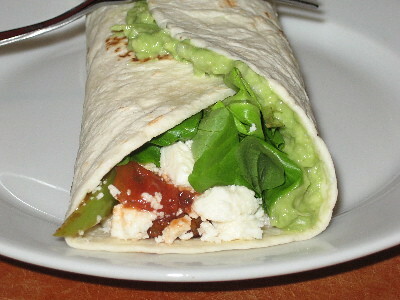 Marinated tempeh, peppers, and onions, topped with queso fresco, salsa, lettuce, and homemade guacamole. Leftovers for lunch today were just as satisfying! Geez, we've been eating a lot of white flour this week! Whoops. 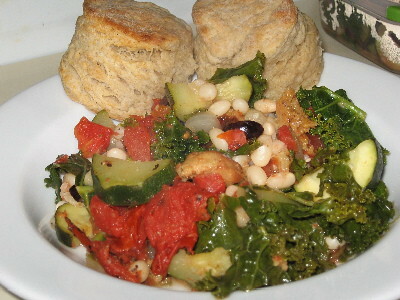 Anyhow, tasty kale and sausage stew from Tofu Mom, with two baking powder biscuits on the side. Man, if I could have, I would have eaten the entire pan of biscuits. I think I'm kind of falling in love with butter a little bit . . . perhaps I'm just channeling my inner Julia Child? How to cook healthy every day and maintain your sanity at the same time! I'm beginning to realize that I'm a bit of an odd duck. I know a couple of people that cook from scratch like I do, but not many! I've always wondered why everyone doesn't cook from scratch like I do, and then it hit me . . . 'cause it's a LOT of work. And a lot of clean-up. 1. MEAL PLAN. Either Friday night or Saturday morning, I sit down and pick out what recipes I want to make for the week. (This also gives Dan the opportunity to add his two cents to the meal plan!) I then go through those recipes, check what ingredients we have on hand, and add the ones we don't to the grocery list. This is also a good time to figure out what things we'll need for breakfasts, snacks, and treats throughout the week, too. While I'm checking on available ingredients, I also clean out and reorganize the fridge. Helps me find ingredients that need to be used up ASAP! 3. COOK AHEAD. I block time most Sunday afternoons for a cooking marathon. I make a big list of all of my cooking projects for the week, and get cracking. 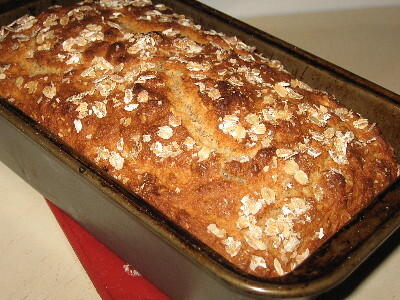 I usually bake one or two things for the week, (usually a breakfast muffin/scone/granola and a treat,) and spend the rest of my time making soymilk, bread, sauces/marinades, shredding cheese, cooking rice, and prepping as many veggies as can be pre-prepped. I go so far as to pre-measure spices for different stages of recipes! My first step in this cooking marathon is usually preparing Sunday dinner, so it's ready to pop in the oven (or serve out of the Crock Pot) when my marathon is over. If I start my marathon as soon as I get home from church, (around 11 AM,) I'm usually done and ready for a nap around 3:30, and this includes cleaning up! 4. THINK AHEAD. For example, we're having fajitas for dinner tonight. 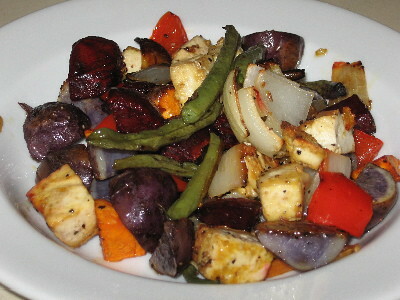 SO, this past weekend, I made the fajita marinade and sliced the tempeh, peppers, and onions. This morning? I had to remember to add the marinade to the tempeh and veggies. Easy enough, right? 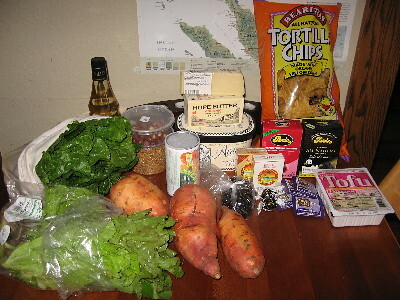 Tonight, all I have to do is cook up the tempeh and veggies, make guacamole, and set out the toppings! Woo! 5. PACK LUNCHES AFTER DINNER. This is something I'm slowly getting better at, but I find it SO easy to just set out a couple of tupperware containers to fill up as we're dishing up dinner. While we eat, these portions cool, so packing fruit, snacks, napkins, and flatware takes seconds after dinner! I'm totally not a morning person, so I love having almost everything ready to go the night before. 6. CLEAN UP AS YOU GO. This is a habit I've developed due to our miniscule kitchen, but cleaning up during "idle time" in cooking has made cleaning up after dinner take less than ten minutes! I always run a sinkful of hot dishwater before I start cooking, and when I find myself with a few free minutes, (onions are softening, water is coming to a boil, oven is preheating, etc.) I wash a few dishes. By the time we sit down to eat, the kitchen is usually almost completely clean! This leaves only serving dishes/pots and our plates, silverware, and glasses to wash after dinner. Speedy! Anybody else out there have awesome tips for staying on top of a healthy, whole-foods meal plan? Please share! Although probably slightly higher in calories than a regular bowl of oatmeal, baked oatmeal keeps well and microwaves easily throughout the week. Yum! Whole grains for breakfast! 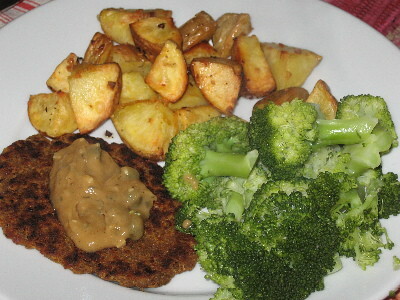 Chickpea Cutlets and Mustard Sauce, both from Veganomicon, with sides of roasted potatoes and steamed broccoli. Hearty, delicious, and satisfying! We've been digging spicy food lately, and this coconut curry did not disappoint. 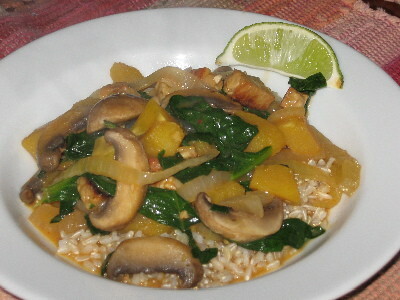 Tempeh, squash, mushrooms, and spinach, in a creamy, spicy sauce, all over brown rice. Yum! 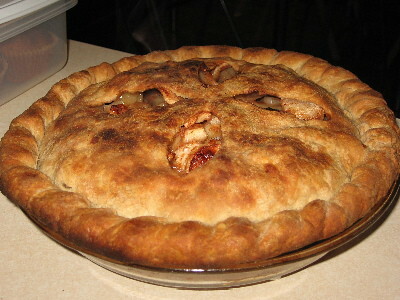 I just HAD to make a pie with some of those apples we picked at the apple orchard last weekend! I don't care if a slice of pie has more calories than my typical breakfast . . . pie is SO tasty. Yum. Hands down my favorite dessert! I know that Isa says that her recipe in Vegan with a Vengeance makes four servings . . . but we get between six and eight servings from one recipe. Whew! (Who can eat that much food in one sitting?) 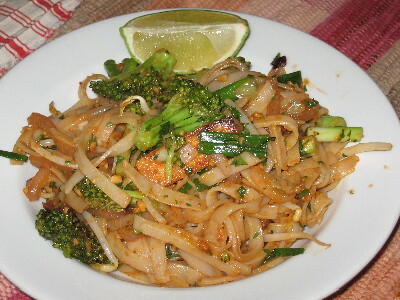 I'm really not complaining, though, because I loves me some delicious pad thai. And this past week, I streamlined the whole process by prepping all of the ingredients, including the sauce, on the weekend, so when it came time to eat, all I had to do was heat a pan and dump pre-measured bags/containers in. Woo! Convenience! 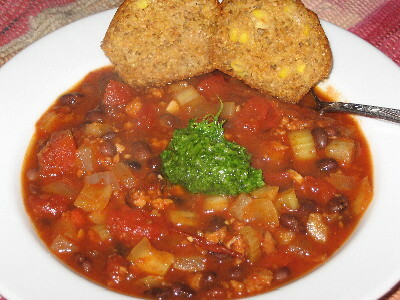 I edited Robin Robertson's recipe for "Black Bean Chili with Cilantro Pesto" by adding some TVP, a canned chipotle pepper in adobo, and four Thai chiles, minced, and threw the lot in my Crock Pot and cooked the chili on high for four hours. Spicy, spicy chili! My tummy may hate my later, but this was FANTASTIC. The cilantro pesto really makes this dish! Corn muffins are extra-dark because I used buckwheat honey to sweeten them, but I love the dark muffin with the golden-yellow kernels of corn poking through. Plenty of leftovers for lunches this week, too!